Born in Fort William, Ontario, Nicolson started his broadcasting career in 1960. 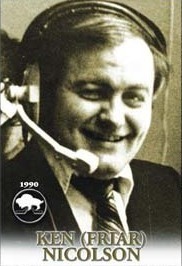 He was named sports director at CJOB in 1969 and began play-byplay broadcasting in 1972 with the WHA Winnipeg Jets. He moved to CKY in 1982 and did NHL colour commentary. Previous to the Jets, `the Friar' broadcast hockey in the OHA, WCJL, the Memorial Cup and for Canada's National team. His Jets coverage took him to Russia, Sweden, Finland, Japan and all over North America. Besides hockey, Ken Nicolson covered the Winnipeg Blue Bombers and the Winnipeg Whips of professional baseball. He was also named to the MSSA Media Roll of Honour.